No document, no transport! All ferry terminals and most shortsea terminals require participation in the Dutch chain solution. 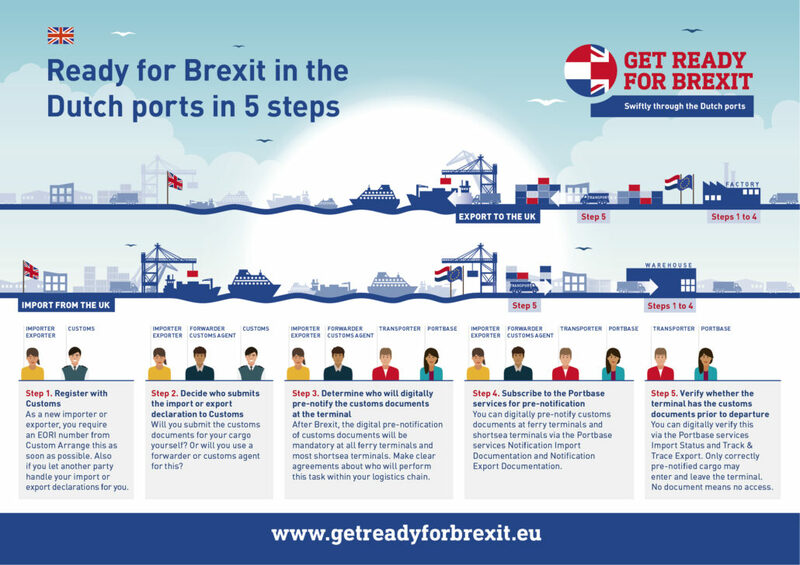 Act now and follow the 5 steps to be Ready for Brexit in time. No relationship with Customs yet? Request an EORI number with them as soon as possible. Every company in Europe involved in import or export requires such a unique identification number. Also if you are an importer or exporter who uses a forwarder or customs agent for your import and export declarations. Please contact national customs as the application process may vary from country to country. After Brexit, determine whether you will submit import and/or export declarations to Customs yourself or whether you will use a forwarder or customs agent for this. If you submit the declarations yourself, you will need separate software and licences. Perhaps agreements with the Netherlands Food and Consumer Product Safety Authority (NVWA) and/or ILT are needed as well. Or, if you are a transporter, a CEMT licence. After Brexit, the pre-notification of customs documents via Portbase is mandatory at all ferry terminals and most shortsea terminals. The importer/exporter can do this, but also the forwarder, customs agent or, on occasion, the transport company. Make clear agreements about this! Without pre-notification, the transporter will not be granted access to the terminal. You can digitally pre-notify and track your cargo in real time via Portbase. For import cargo, subscribe to the services Notification Import Documentation 2.0 and Import Status. For export cargo, you need the services Notification Export Documentation and Track & Trace Export. Only cargo that has been digitally pre-notified can enter and leave the terminal. Otherwise, the container or trailer will come to a standstill here. Therefore make sure to always use Portbase to check the customs status at the terminal. No transport without a pre-notified document. Read here specific information for customs agents, exporters, importers, forwarders and transporters.